The thought of RVing full time can be one of the most exciting thoughts that come to mind, but it can also keep you up at night with fear. When we first starting RVing, I can remember getting sick in my stomach and having a hard time sleeping the night before we left our site. Would I get stuck somewhere and not be able to turn around? Would I blow a tire on the towed vehicle and not know it for 50 miles. Would I be that guy? 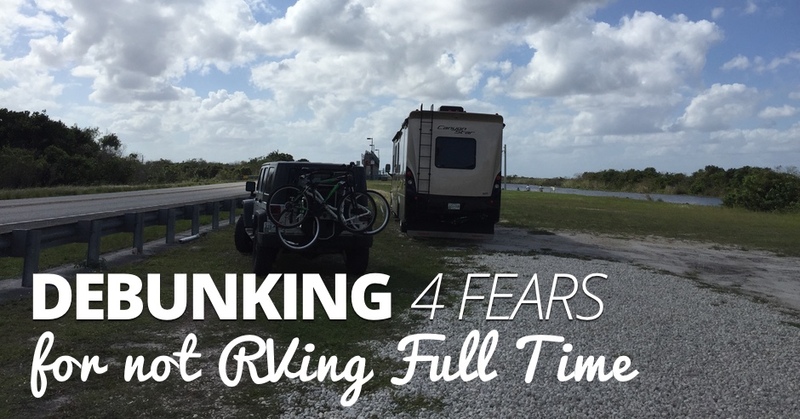 I had many fears before I began RVing full time. Truthfully, I still have fears. And that’s ok.
A little bit of fear is healthy. Without fear, I could have a youtube video of an idiot mistake featuring myself every month. Every fear I am going to mention was (and at times still is) a fear of mine. But <strong>every</strong> fear can be overcome and should be overcome because RVing is worth every bit of anxiety that comes with it. 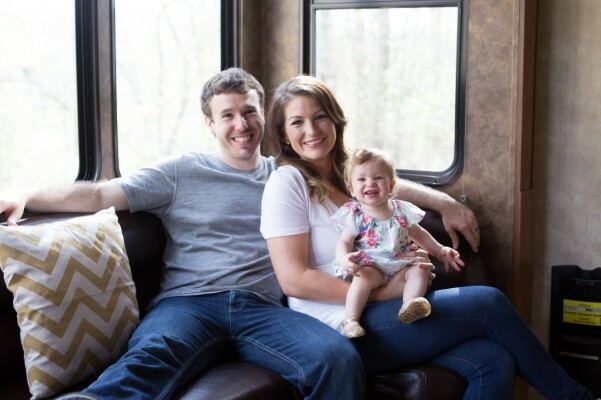 To those of us who aren’t mechanics (like me), constantly moving around in a giant motor-driven house on wheels seems like a ticking time bomb. We have three engines with us when we move around. The motorhome, the generator, and the towed vehicle. That’s a lot of opportunity for engine problems. The extent of my engine knowledge before RVing full time was changing the oil with my dad as a teenager. Even with three engines and constant moving parts throughout the RV, mechanical issues have not held us back from getting out on the road. If we are near our hometown of Cookeville, Tn we have plenty of resources for consultation or help with RV problems. Even if we are in the middle of nowhere, Youtube, Blogs, and Forums are a huge help. RV engines today will almost always outlast the RV itself so other than routine maintenance, they should not be a concern. Routine maintenance should actually be your main focus when it comes to preventing problems with your RV. Especially maintenance to the top of your RV (roof) and the bottom of your RV (Tires). The big 3 are the engine, the roof, and the wheels. Keep those in tip-top shape and you can at least drive to someone who can help solve the problem. No one ever died from one of their two AC units going out. Their wife may have threatened to take their life, but that’s for another blog post. There’s a bit of truth to this one, in the beginning at least. I’ve been amazed at how we’ve adjusted to each RV we’ve owned. I’ve learned to never judge a house or RV by my first impression of when I walk into it. Our current motorhome initially looked too small for us. However, after looking at other layouts and then coming back to it, we adjusted enough to it to give it a shot. Now that we’ve been living in it a few months, it feels like the perfect size. We rarely feel like we are confined. Is it a small space? Sure. But we are happy to call it home. One side note on what could make you go crazy though. 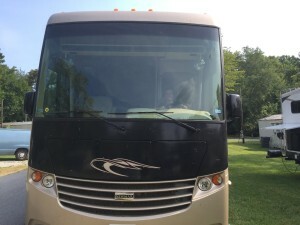 If you are moving into a motorhome with someone or someone’s you don’t enjoy being around, it typically will not get better with a small space. Those annoyances will be magnified and stress will only spike. I’m not saying that is always going to happen, but more often than not, it will be a problem. So will you go crazy in a tin-can RV because of the RV itself? Nope. Could you go crazy because of the people in the RV with you if you can’t stand each other? Yup. Great news. Neither do we! When we decided to start RVing Full Time my wife told me she would not be hauling laundry to a laundromat. This limited the RVs we could purchase, but it was not a deal breaker. We ended up buying an RV with washer/dryer hook ups for an RV washer dryer combo. If you want an RV that has hookups for a washer and dyer you will likely be looking at a fifth wheel or motorhome that is at least 35ft long. That’s not to say travel trailers or RV shorter than 35ft don’t have hookups, but they are not the norm. We opted for a combo RV washer and dryer rather than a stacked set and do not regret the decision one bit. The unit is not as large as an at-home washer and dryer, but it gets the job done and the wife is happy. Gentlemen. Keep your wife happy. Making your wife angry while RVing is something you should fear. This was one of my biggest fears going into RVing full time. I had pretty much zero experience with pulling trailers or driving a huge vehicles at high speeds. While a teenager, I worked on a farm. So, I had spent time in tractors and trucks. But driving something farm equipment 5-10 mph in a wide open field vs 65mph on a three lane interstate while being passed by two Semis at the same time, are two entirely different animals. Much like the “I’ll Go Crazy in That Tin Can” fear, this one has faded over time. I still have a bit of fear at times (high winds, mountain driving, heavy rain, and major cities), but experience is the best cure for driving something new. Well, experience and prep. If you have never driven anything large before, it’s not a bad idea to find someone who has and let them drive it while you watch and ask questions. You may also want to pick a day when traffic is low in a familiar area so you can drive around and get a feel for how long it takes to stop and wide you need to make turns. I am a planner. So when it comes to a trip, looking ahead and at least feeling like I am somewhat in control has helped as well. Plan your route, weigh your RV, and ensure tires and brakes are all up to par. As time has gone on and I have become more comfortable with my rig, planning has decreased, but prep work like making sure your RV is within specs and in great driving shape should never be skimped. The thought of living full-time in an RV initially freaked me out, but after making "a few" mistakes and learning to laugh in the meantime, I've come to love the RV life.